It was not your typical atrial fibrillation case when I walked through the ER door. Hold onto your eyeballs for this case with two important lessons. Classic atrial fibrillation with rapid ventricular response, right? Well yes, it is ... but things get a bit complicated. 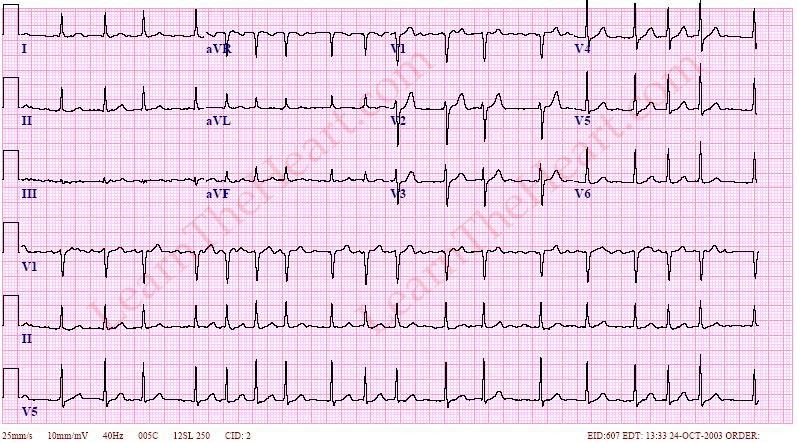 Physical exam reveals a tachycardic, irregularly irregular rhythm with a III/VI systolic ejection murmur at the left upper sternal border heard best at end-expiration. There are rales at the lung bases which are dull to percussion. He has 2+ pitting edema all the way up past his knees. Pretty obvious heart failure findings, but interestingly, he has significant bulging of his eyes (exophthalmos or proptosis) and a bit of a goiter. The diagnosis? This patient was taking a weight loss supplement that must have contained a thyroid hormone-like drug, or he coincidentally developed hyperthyroidism (Grave’s disease). His TSH was undetectable and the endocrinology service was consulted. Atrial fibrillation occurs in 5% to 15% of hyperthyroid cases. Beta-blockers are the preferred rate controlling agents during a hyperthyroid state (class I). Non-dihydropyridine calcium channel blockers (diltiazem, verapamil) can be used if beta-blockers are not tolerated or contraindicated. Propanolol specifically inhibits the conversion of T4 (less active) to T3 (more active), which is beneficial in hyperthyroidism. A majority of patients will convert to sinus rhythm once the hyperthyroidism is treated (55% to 75%). How about that heart murmur on exam? That is called a “Means-Learman scratch” and is thought to occur from the pericardium rubbing against the pleura in the high output, hyperdynamic states of hyperthyroidism and may sound similar to a pericardial friction rub, as seen in pericarditis. He was put on an IV drip of diltiazem to slow his heart rate, which seemed to work well. Some furosemide IV was given and an echocardiogram was ordered. Endocrine decided to use oral propranolol to help with the hyperthyroid state. Know the ejection fraction in atrial fibrillation before you give AV blocking drugs, especially if there is any clinical heart failure. Giving strong negatively inotropic agents like non-dihydropyridine calcium channel blockers (diltiazem or verapamil) or beta-blockers that reduce the contractility of the heart can cause a significant decrease in cardiac output if systolic heart failure (not diastolic) is present. Sometimes you won’t have the ability to get an echocardiogram immediately, so be cautious and use your clinical judgment until you know for sure. In this case, his ejection fraction was about 10%. He was put on diltiazem, which has negative inotropic effects. All it took was one dose of oral propranolol and his cardiac output dropped so low that he became markedly hypotensive and had a PEA (Pulseless Electrical Activity) cardiac arrest. Let's review AV blocking agents for atrial fibrillation and heart failure. When the ejection fraction is normal, we use beta-blockers or dihydropyridine calcium channel blockers as first-line, digoxin as second-line and amiodarone as third-line to slow the heart rate down in atrial fibrillation. When systolic heart failure is present, digoxin is first-line since it actually increases cardiac output and slows down the heart rate. Unfortunately, digoxin alone is rarely enough to completely lower the heart rate to the desired level. Amiodarone for rate control is actually considered second line, but are you going to give this to your patient in a hyperthyroid state? Not a good idea. If you were, then review amiodarone toxicity here. The beta-blockers that are FDA-approved for systolic heart failure can be used when the ejection fraction is low, but with some degree of caution. These are carvedilol, metoprolol succinate (not metoprolol tartrate) and bisoprolol. Usually, a low dose is used initially until the heart failure is more stabilized. The ACC/AHA guidelines for rate control of atrial fibrillation give a class III indication (potentially harmful, not recommended) to non-dihydropyridine calcium channel blockers (diltiazem, verapamil) in the setting of decompensated systolic heart failure and state that they “may exacerbate hemodynamic compromise” in this setting. This lesson was learned the hard way in this case. When systolic heart failure is well-compensated (few symptoms and not volume overloaded), diltiazem and verapamil may be used as a last resort in low doses with caution to slow atrial fibrillation heart rates. However, they are not good long-term in these patients. If the ejection fraction is reduced only moderately (45% to 55%), it may be reasonable to try a low dose.